Heading home after a Birds in Flight photography session I spotted this duck for the first time ever at Woodbridge Island. Not sure what duck species I went home and identified the duck as the Common shelduck - with some assistance from the very knowledgeable bird photographers / bird watchers over on the Birdlife South Africa Face Book Page. 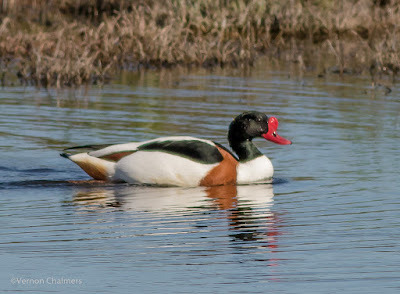 Common shelduck captured with Canon EOS 7D Mark II / EF 400mm f/5.6L USM lens. Due to the distance the image quality is unfortunately not that great.